There was a time when the turntables were found in almost every household, the only source of listening to some tunes back then. This trend has changed dramatically over the passage of time. 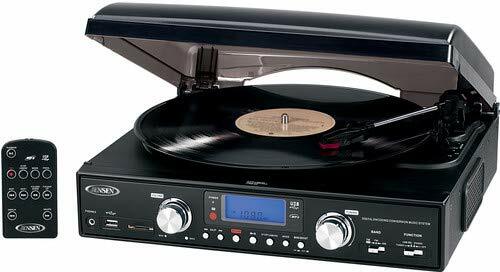 The modern day devices like MP3 players had taken over a great deal from these turntables. But if you are a music lover and want to listen to some tunes that are not digital, these turntables are the right option for you. The Jensen JTA-460 3-Speed Stereo Turntable can come handy in this regard. Jensen is the manufacturer of this particular turntable, a company that is famous for a lot of its best quality electronic products. The Jensen JTA-460 3-Speed stereo turntable is one of its kind, there are a lot of turntables available in the market but none has the technology quite like it. The Jensen JTA-460 3-Speed stereo turntable comes along with MP3 encoding system as well. So now you can convert your vinyl records in to MP3 format even when you do not have a computer that is MP3 compatible. The Jensen JTA-460 3-Speed Stereo Turntable with MP3 Encoding System and AM/FM Stereo Radio (Black) also has built-in stereo speakers that are a rarity with most of the other turntables of its kind. It also has a port to attach external speakers. 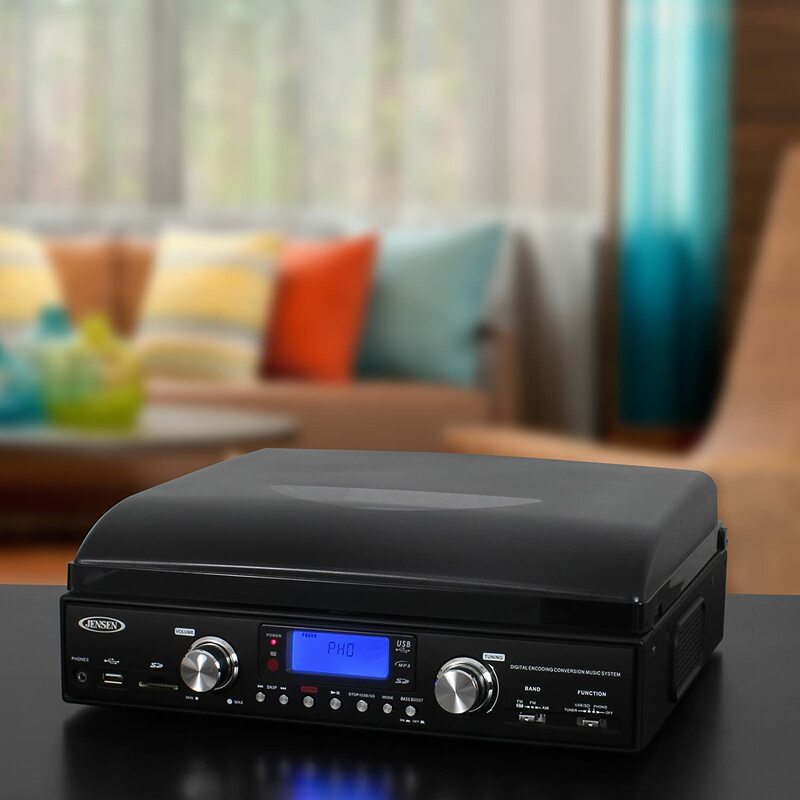 Another impactful factor about this turntable is the AM/FM receiver that has a digital frequency, giving it a pretty high reception as compared to some other turntables. The price that it comes in is a pretty reasonable one, when looking at all the qualities that it is equipped with. The looks of this vinyl player are quite impressive. When having a turntable this feature comes in account, that how it looks in the room. The Jensen turntable will not only look good in the room where it is kept but also can contribute to the décor of the room. The fact that MP3s can be played on the Jensen turntable makes it more interesting for the user. Most of the vinyl players available in the market have a capacity of playing 3-in-1 i.e. they can play vinyl records, CDs and AM/FM radio. But with the turntable you also have an option to play MP3 music through a USB. The Jensen turntable also has an AUX port, which is not found in most of the vinyl players available out there. This Vinyl player also has a set of built in speakers which gives it a slight edge over most of the other vinyl players. The price is nothing as compared to the features that it has on offer. The tone arm of Jensen turntable sometime skips, creating a sound that sounds pretty bad to your ears. This is quite a problem when you have a vinyl player. A slight disadvantage of having this Turntable is that the dust cover at the top has a small back opening, this allows the dust to flow in and your records can get really dusty. The Jensen turntable comes in with an option of recording the vinyl or AM/FM radio to a USB or a flash drive in MP3 format and that too without having a computer. This is quite a distinguished factor this turntable has, hence making it a lot better than others. If you have a pretty old vinyl that you want to record on a flash drive or a USB in MP3 format, the turntable is the perfect option for you. So now you can also listen to your dad’s vintage vinyl collection in MP3 format. Most of the turntables in the market do not have built-in speakers, but when talking about the Jensen turntable it has a pretty powerful built-in speaker system. The built-in speakers are not that loud that they can blow up the roof, but still the sound is pretty rich when you are listening to it inside the house. The Jensen turntable also comes in with an AUX port, which is a rarity in most of the other turntables. You can connect a set of loud speakers if you want to listen to some pretty loud music. You can also connect your headphones when you want to listen to it alone. The Jensen turntable comes in with 4-in-one option to play MP3 as well, which is the fourth option. You can not only listen to MP3 music but also record vinyl to a flash drive in MP3 format. The dimensions of the Jensen turntable are 17 x 15.8 x 15 inches, with a weight of approx 7.8 pounds. The Jensen turntable has a reasonable price which is quite a reasonable one keeping in mind the advantages that this turntable has. When talking about the performance, the Jensen turntable does not have any competition among all the turntables that are available in the market. The turntable has a warranty of one year that is given by the manufacturer Jensen. When you have such a gem available in such a price and then backed up with one year warranty, what more could you ask for. The Jensen JTA-460 3-Speed Stereo Turntable with MP3 Encoding System is one of its kind when talking about the features specifications and all the other merits that it brings along. There are quite a few turntables available in the market but the turntable surely is at one of the top spots among them keeping in mind the performance and the price.